Pavel Kashin was attempting to do a backflip on a 16-story building when he lost his footing. The moment before Pavel Kashin plummeted to his death. When a parkour daredevil loses his balance on top of a tall building and has a brush with death, it’s a terrifying moment. When it happened to Pavel Kashin, it was fatal. Pavel Kashin was a Russian parkour artist from St. Petersburg. In 2013, he was performing a stunt on the rooftop of a 16-floor building as a friend was filming him. Hence the photograph of Kashin captured just seconds before his fall and death. ‘Parkour’ derives from the French word parcours, which means ‘route.’ Developed from military obstacle training, it’s a system for going from point A to point B by rolling, jumping, leaping; Essentially getting around various obstacles likes walls and stairwells in the quickest time possible. Parkour is done without the use of safety equipment. And it has attracted thrill seekers from all over. Parkour instills a spirit of adventure for many and enthusiasts typically think of themselves as part of a connected community. But for the most daring, there is always the potential for danger and death. On the day Kashin died in July 2013, he was standing on a three-foot wide ledge on the top of an apartment building. The Russian daredevil was attempting to do a backflip when he fell nearly 200 feet to his death. Witnesses told the police that he had lost his footing on the landing, causing him to plummet straight down onto the pavement below. 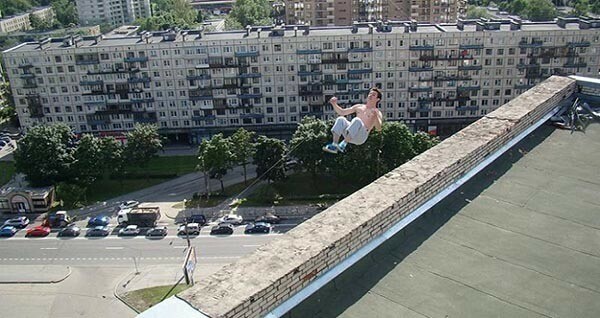 Kashin’s friends and fellow parkour enthusiasts called the move a “brave jump.” They uploaded the photo taken of his final stunt, which was then heavily circulated around the internet. Kashin’s parents approved of the image being uploaded. In addition to paying tribute to their son, they believed it could serve as a warning to others who partook in parkour type activities. There have been several incidents of people partaking in similar life-threatening stunts and Kashin’s parents thought that his memory could encourage them to not take the risks of the sport too lightly. They issued a statement at the time saying that they hoped the photo would deter other daredevils from attempting risky jumps. His father said he hoped the example would save someone’s life. There haven’t been many other recorded deaths or major injuries attributed to parkour accidents. However, some argue that that this is because people would rather say they simply fell instead of attribute the mishap to parkour. Pavel Kashin was buried in St Petersburg. If you found this story on Pavel Kashin and his infamous last photo interesting, check out this article about Jumpy, the dog who does parkour. Then take a look at these haunting photos of people just before they died.